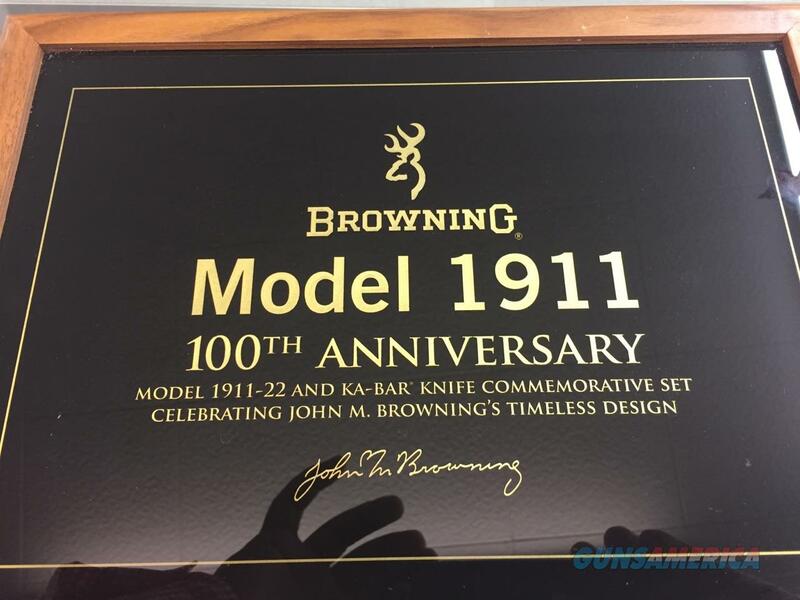 Browning 1911-22 100th Anniversary Commemorative. Description: A very nice commemorative set honoring John Moses Browning's timeless design of the 1911. The gold leaf banners and scroll designs are nicely done on both sides of the slide and a gold leaf signature of John M Browning on top of the slide. John M. Browning developed the Model 1911 to fire the powerful 45 ACP cartridge. Browning developed it to fire the 22 L.R. and, after extensive testing and research, determined that 85% of the original size was ideal for the smaller cartridge. Put one in your hands and you’ll agree. The grip is comfortable even in large hands and feels equally at home in smaller ones. The lightweight alloy construction is anything but light duty. Own a little piece of history today.